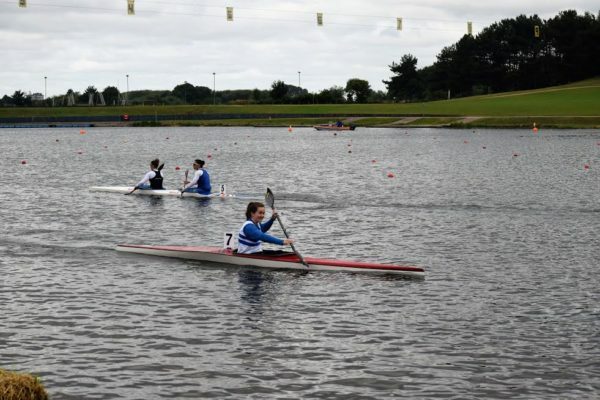 We were a small team at July’s Nottingham regatta – six Juniors, three Seniors and two Masters – but judging from the results, all were in top form. And that’s despite it all those school exams. 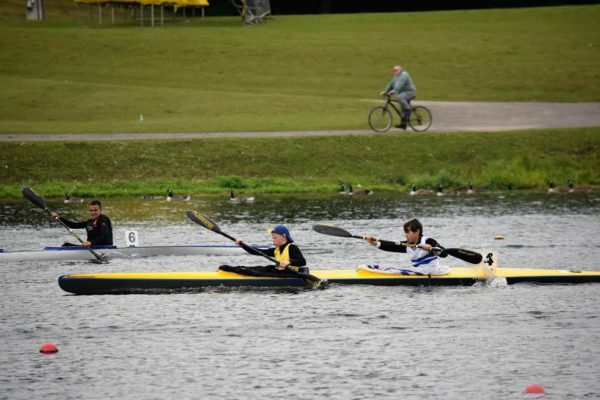 Lilli stormed the final of K1 500m Girls D, taking 1st, and, racing K2 for the first time with Jesse from Banbury, was 2nd in their K2 500m final. Well done to Lilli – she has gained promotion to Girls C.
Fran, for the first time in Girls C, raced well in her K1s and won both her K2 races 200m and 500m with Molly from Norwich. Finlay was racing K2 for the first time with Sam from Wey. They looked really strong and great timing. He also looked impressive in his K1s, racing fearlessly for the first time in his Zedtech. Dan A was racing really well in Boys A, getting into A Finals for all his K1 races. He and Jim looked really strong in Men’s A/B K2 500m. Fred was on form with an impressive two-boat length lead in his 1000m Boys A K1 final (B), and with an impressive time. He was 3rd in his 200m final, missing 2nd by .05 sec. That close! His favourite race was K2 200m with RLS’s Alex, with a very convincing win, 3 seconds faster than the next nearest boat. 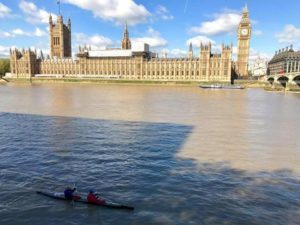 Both Dan and Fred raced together in a K4 they’d put together with Ealing and Richmond. Their 1000m, last race of the day, was uplifting to watch, with their crew totally in command, ‘sailing’ past the rest of the field and finishing with at least a two-boat length lead. 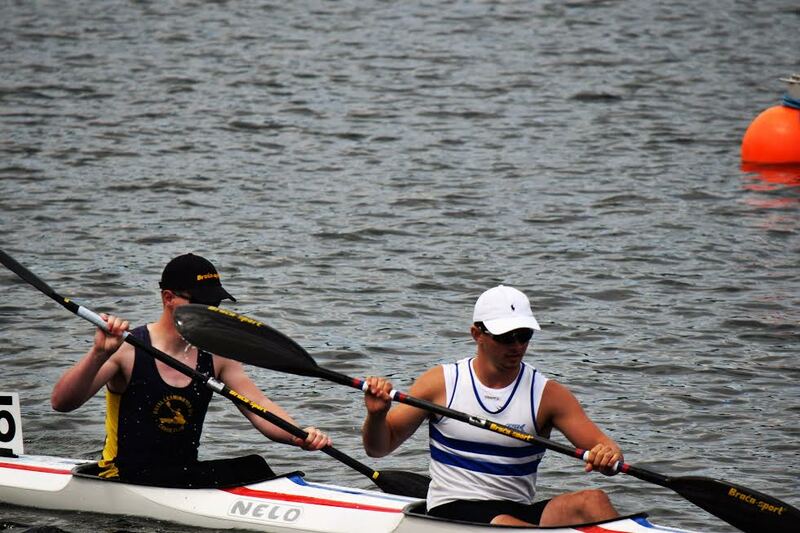 Great to have Neil Barton racing for Reading, taking 3rd in his K1 200m final Men’s B, not his usual distance at all! Kat in Women’s C took a very convincing 1st in her 1000m final and was just pipped into 2nd in her 500m final (by .06 sec!). Kat and Immi jumped into a K2 for Women’s A/B and showed us all how it should be done. And our Masters – Nik and Lee – raced very well, taking 3rd in their K2 1000m. In their K1 races, Lee was 3rd in 200m, Nik was 2nd in 200m and 3rd in 500m, impressive when they’d been the ‘party boys’ the night before! Poor Finlay, did you get any sleep?! All got to their races on time, albeit with a couple of numbers missing. A number-nicker was at large – no kidding! A great racing weekend. Last Saturday 6 paddlers competed at Shepperton and experienced their first weir slalom. With the noise and flow of water from the weir, our paddlers were quickly out of their comfort zone. With grit determination and after many swims, they made big improvements in their water skills. 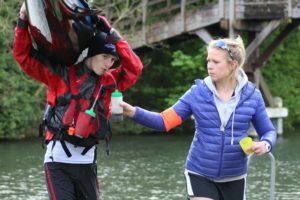 Alex Tonkin recorded a good run at his first ever slalom beating many paddlers from the higher division and gaining promotion to Division 3. Also, after much practice and a few swims, Duncan Edwards achieved a fast final run to win the Division 3 competition. All must be commended on their perseverance on new and challenging water conditions. Special mention to Peter Skinner who even after 8 or more capsizes never gave up and received Best under 12 in Div4! 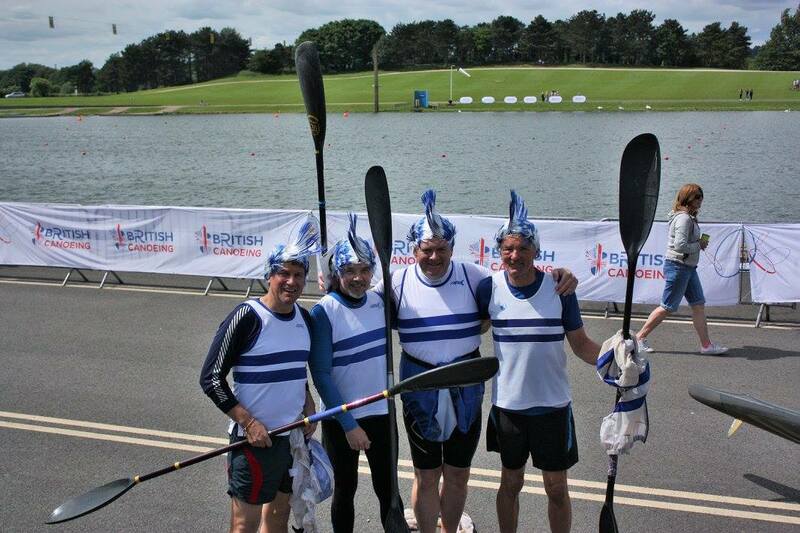 We had a smaller team at June Interclubs regatta this year, just 26 paddlers in all, but some great results. Reading CC finished 5th out of 55 clubs and only 27 points behind the winner, Richmond. Below are some highlights of the weekend. First off, great performance from the weather – bright and sunny with increasing winds, but not a dreadful gale … like the very wet and gusty following two days. 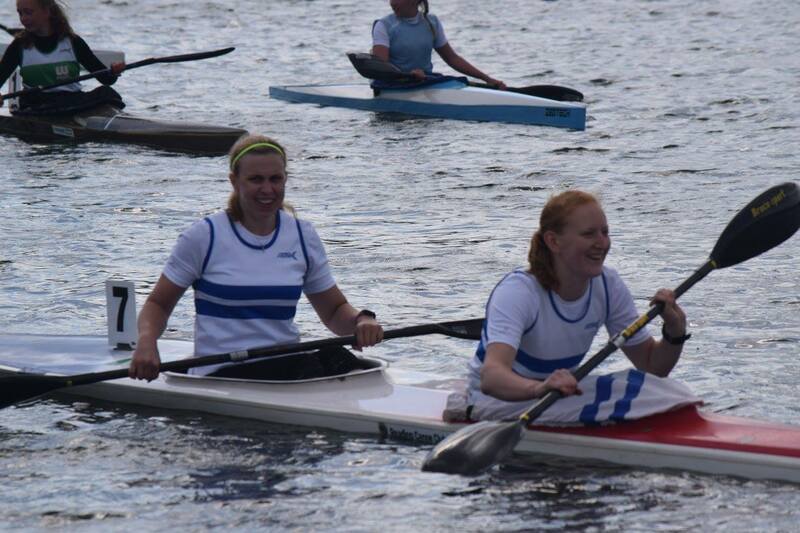 Great to see Annabel and Phoebe both back on the water racing. Nigel took three 2nds and a 3rd in his K1, K2 and K4 races. Indeed, Nigel and Brian’s K2 500m time was 2:15:31, while 1st place was 2:15:09. A hair’s breadth difference. 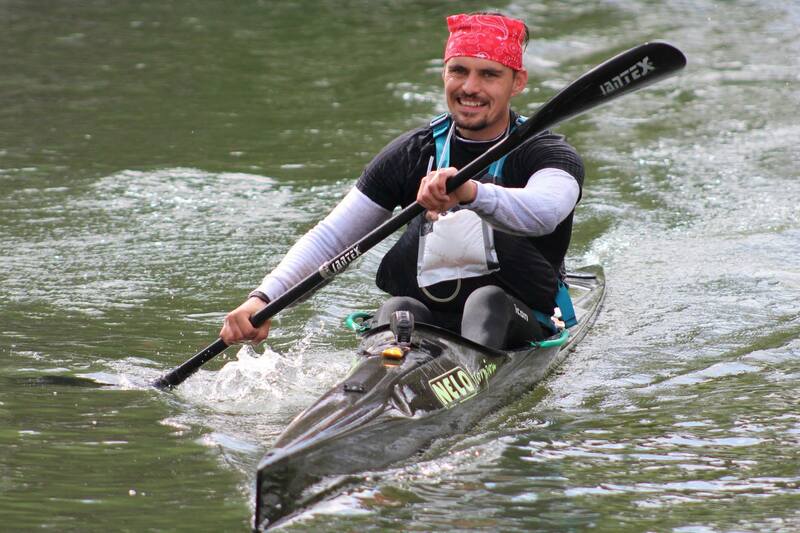 Nik Topham was 1st in his K1 500m, easily – promotion for you, Nik? 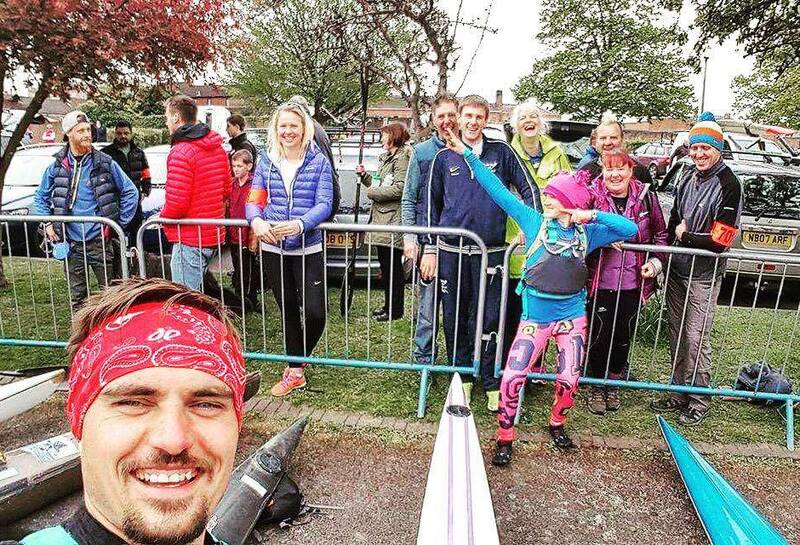 Rachel Spanton, Silke, Nathan Betts and Jim Towell were all new to Nottingham sprints and took to it with gusto. Silke used to sprint for the National German team, so she seemed to feel very much at home. Well done to you all – a great team and finishing 5th out of 55 clubs with just 26 paddlers is a great achievement. 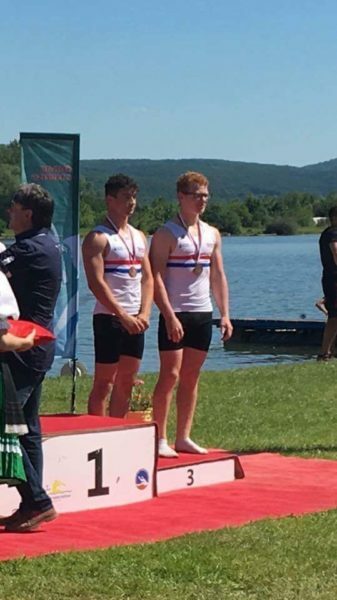 While most of RCC paddlers were battling it out on the Thames at the Reading hasler, RCC junior Fred Kemp was representing GB at Piestany International Regatta. Fred’s strongest performance is usually in 200m and this certainly proved to be so at this regatta. In K1 200m, he took first in both the heat and the semi-final and in the final fought his way to 5th. In the K2 200m with Alex Greaves (RLS), they won the heat, so went straight to final and there took a convincing Bronze medal. The GB team did very well overall, coming home with three Silver and three Bronze medals overall. Big well done to Fred. 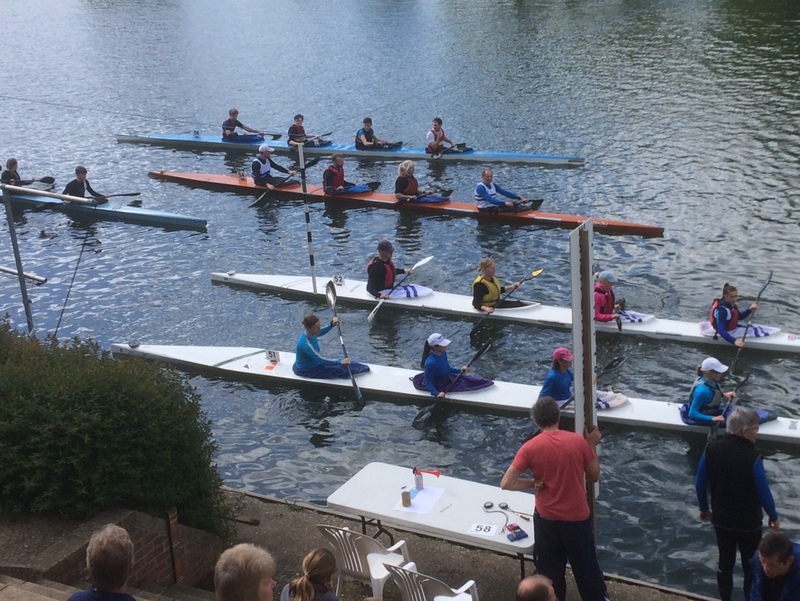 The weather was kind and the enthusiasm high as teams gathered from Reading, Wokingham, Pangbourne, Southampton, Weybridge and Addlestone for the first K4 event of the year. With a smaller field than usual entering the K4 race, the Club had decided to make it a single 5km handicap race, followed by 200m sprints. The teams were ranked according to their combined division for the handicap 5km race and two rockets were first to start. Fastest boat on the water with a whizzy 19:10 mins was Reading’s Under 23 Div 3 boat of Imogen Collins, Jim New, Connor Macnab and Alex Sheppy. Not far behind were Southampton/Wey with a 19:50. 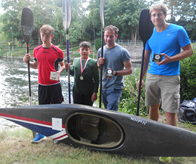 While 3rd place went to Reading Vets Nik Topham, Yan Rasiborski, Kevin Smith and a mystery paddler. After the 5km race, heats were drawn up for the 200-metre sprint. The 2 fastest from each heat went through to the semi finals, and the winners of these made the finals. There was a consolation final for the ‘losers’ too, so everyone got a chance to race more than once. It was all lots of fun, with the winning cup going to the speedy Reading crew again. It was a great morning for all ages and abilities. Thanks to everyone who took part, the visiting teams for making it up to Reading and to the organisers. Here’s to the next one in October!! Congratulations to the Reading Slalom paddlers for their success at Winchester Slalom on 14th May. 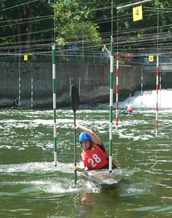 Ten Reading paddlers competed in their very first slalom against other division 4 paddlers. Competition was fierce. Many of ours achieved clean, fast runs posting excellent times. Everybody deserves to be very proud of themselves for giving their best on the day. 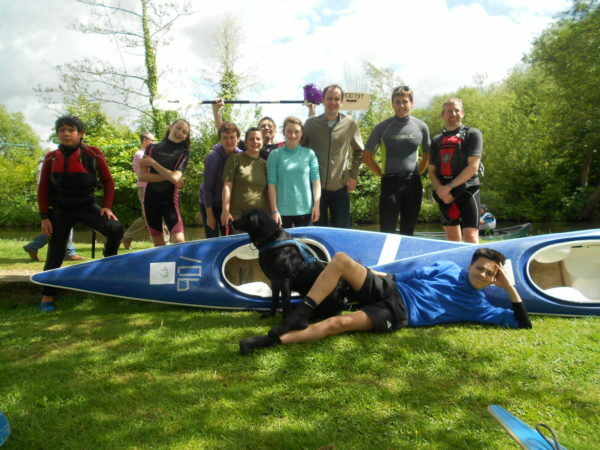 Success was also achieved in a wave hopper competition – 750 metre dash down the river resulting in a 1st for Duncan Edwards and awards to Marc Gutteridge and Andy Field. Maybe more WWR racing in the future? Jodie Barker -1st in Div 4 K1 women, overall winner and promoted. 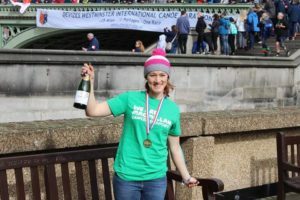 Natalie Neville – 2nd in K1 Div 4 women and promoted. 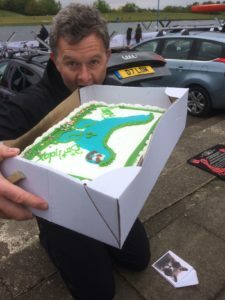 Andy Neville – 2nd in K1 Div 4 Men and promoted. Duncan Edwards – 5th in K1 Div 4 Men and promoted. Duncan Edwards – 1st in C1 Div 4 Men and promoted. Andy Field – 1st in Open Class. Here’s to an incredible achievement from all, well done!! Well done to all RCC paddlers at this weekend’s regatta – a great set of results. Saturday was windy, a tail wind in fact, but those waves, particularly from 200m to the finish line, were not helpful! 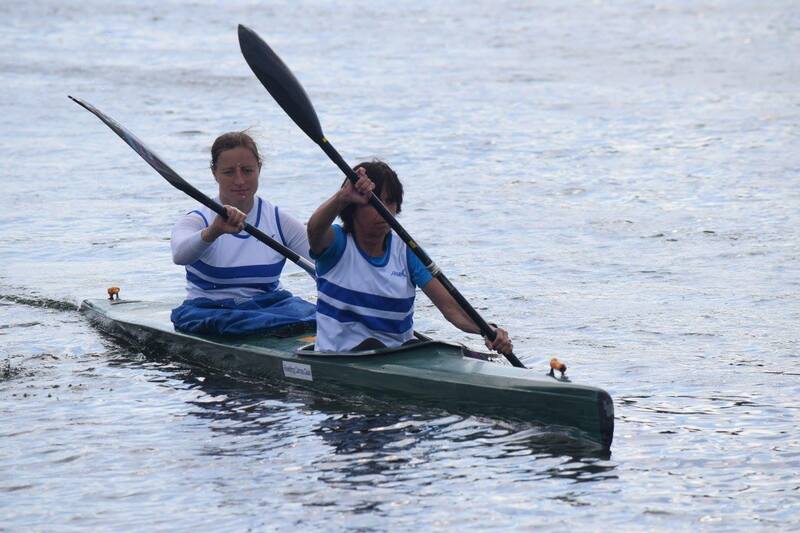 Still, our paddlers took all that in their stride and there were some great performances from Juniors and Masters alike. Great to see our two Juniors promoted last regatta – Dan Atkins and Fran Boonham – racing really well in Boys B and Girls C respectively and getting into Finals every race. Our two Boys D paddlers, Sam Betts and Alex Tonkin, also did a brilliant job, getting into a final every race, and really pushing hard and accelerating into the finish. It was Finlay’s first regatta in Boys D and he raced well in both his 200m and 500m distances. Fred in Boys A put in good performances, particularly in his 200m K2 which was Mens A/Boys A combined. They came a 3rd. We had a good show of Masters at this National Championships regatta, also getting into every final. 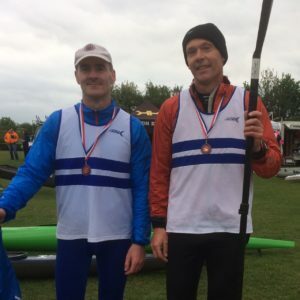 A Bronze and a Silver each for Brian Hammond and Tom Hollins in their O34 K2 races. Well done to all our Masters – Nigel, Nik Topham, Tony Machin, Lee Atkins, Brian and Tom. 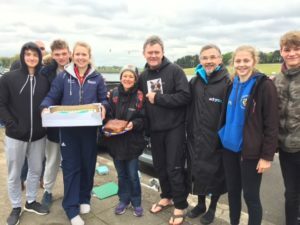 And it was a Birthday regatta for Lee too – hence two birthday cakes and a special Birthday swim … perfectly time for past the finish line! 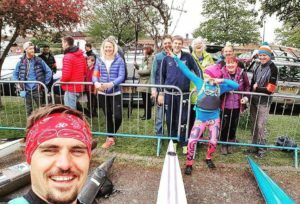 After an excellent Awards Evening at the Club the night before, members kicked off their party shoes and took part in a mix-and-match 10k (mostly) K2 fun race. After the all rain, even the sun came out. Well done all RCC members – it’s been a great year of achievement and results.